Older and wiser? You're having a laugh. Getting older makes you feel vulnerable; fearful for your knees and your loved ones; unsure of everything when you used to know it all. You cry at the most ridiculous films. Look in the mirror and see your ancestors. As for your teeth, and gravity: Jesus. You fall apart. Thank heavens, then, for Withered Hand, who plies us with gorgeous pop solace and punchlines vis-a-vis this sorry yet celebratory state of affairs. The Edinburgh-based DIY alt-rock bard, also known as Dan Willson, explores the vagaries of ageing (guilt, temptation, cough medicine, death, and love in its myriad complex forms) on his beautiful second album, New Gods - from a piano-fried rock 'n' roll rant about life's incendiary passage ('Heart Heart'), to a cracked-Americana ode to quiet ardour and mortal fear ('Life Of Doubt'). It is enlightening, wry and devastating, but most of all, it's life-affirming - a kick up the arse for the maudlin among us; a reminder that the brightness of the right (or wrong) smile is all we need. It's wise as well, but never preaching. Cardinal opener 'Horseshoe' sets the tone with its gilded indie tribute to not knowing your own strength ("did you put a horseshoe in my glove? "), facing down loss, and being haunted by the ghosts of words ("for every song, a song unsung") - while several tracks riff on the truism that we don't change as we age; we just get used to it. 'Black Tambourine's glorious, choral-rock anthem states, "I'm older now, but I feel the same", and that's preceded by Horseshoe's droll observation that, at heart, we're all still teenagers ("Here I stand with a face like somebody died, when you're ignoring me"). There are other deadpan moments too, not least the panicky, punk-strutting narcissism of 'Heart Heart' ("I look into your eyes and all I see is my reflection, and it turns me on") and some comically literal verse on 'Black Tambourine' ("I'll sing it twice / I'll sing it twice"). If Willson's remarkable 2009 debut, Good News, heavily referenced his religious upbringing (he was raised as a Jehovah's Witness in Bishop's Stortford), then its follow-up eyes rather more fiery celestial deities – namely the sun and the stars in the sky. The title track is an exquisite bass-and-tambourine psalm that gives the long-player its bearings ("I counted lucky stars above a field in Switzerland / New Gods for this ungodly man") and salutes the cosmos' universal charms ("Somewhere just out of view, above our heads there burned a flame / now tell me we are not all the same"). That warm sentiment illuminates the record: 'Horseshoe's radiance ("did you paint the lustre on the sun for everyone? "); 'Black Tambourine's (re)assurance ("isn't everyone lonely? No"); the sun-scorched trilogy that chronicles Willson's trip to SXSW / America in 2011 - 'Love Over Desire' (say no more), 'King Of Hollywood' (dedicated to his long-time ally King Creosote) and 'California' (a balmy homage to cough medicine abuse, cicadas and impending doom). 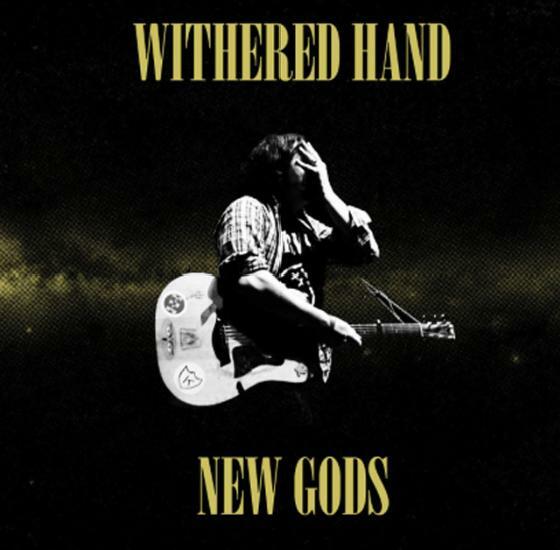 New Gods' musical arrangements are similarly astral / social: a song for King Creosote must of course feature said Fife alt-pop demigod (Willson is part of KC's much-loved, and thriving, Fence Collective - rumours of its demise have been greatly exaggerated). Likewise, 'Black Tambourine' salutes its legendary DC noise-pop namesake, and stars that band's wondrous Pam Berry on backing vocals. The rest of the album features a role-call of musical comrades and kindred spirits: Frightened Rabbit's Scott Hutchison, The Vaselines' Eugene Kelly, Belle and Sebastian's Stevie Jackson and Chris 'Beans' Geddes, doom-folk topographer Rob St John, and producer Tony Doogan (Mogwai, Hefner, The Mountain Goats) - not to mention Withered Hand's (hard)core members, who also play in eagleowl, The Leg and The Second Hand Marching Band. This collective ethos culminates in a gospel-fuelled, euphoric finale, full of voices and love and hope and brass fanfares, and an abiding, over-riding message: you are not alone. Much has been made of Willson's so-called frailty: his fragile voice; his broken faith; his sensitivity. But his resilient guitar-pop and iron-clad verse are deceptively forceful - he'll knock you for six. And he's brave enough to sing these songs; cocksure enough to say it's okay to fumble your way through the days, to be lost for words and to make mistakes. He's convincing enough to tell us to look up at the sky and see what we want to see. We all need something to believe in.